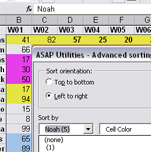 The new version of ASAP Utilities, 4.5.8 has just been released! We have added a few new tools, made some improvements and fixed a few bugs. Download ASAP Utilities 4.5.8 View the changes. Many thanks to everyone who has contributed their feedback!